Product #21713 | SKU NBB75DFIB | 0.0 (no ratings yet) Thanks for your rating! The Isolated BNC Chassis Connector in D-Shape Housing (Black Chrome) from Neutrik is a feed-through connector which offers a true 75 Ω design for serial and digital (HD) signals. 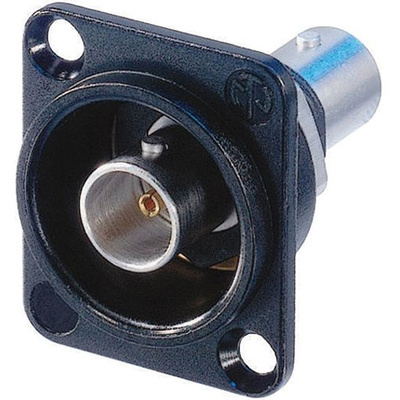 It features a machined brass connector body that provides an extremely rugged and non-abrasive connection over long term use. In addition, it is recessed and therefore well protected in a D-shape housing (audio industry standard). The BNC Chassis Connector features a gold plated cage type center contact, which provides the best possible shielding and lowest contact resistance. It has an extremely robust closed contact design. It offers a true 75 Ω design that meets stringent HD requirements. The BNC Chassis Connector's isolated panel mount feature solves potential grounding problems and prevents common-mode influence with other connections conducted over the same panel ground potential. Its standard D-shape housing provides flush mounting and protection from damage.